Enrolments for 2019 are OPEN We recommend early registration as many courses will fill very fast! You can book and confirm your place on line any time of the day or night. During the school year we are open from 9.00am to 3.00pm, Monday to Friday. During school term time when courses are running, our office is also open Monday to Wednesday from 3.00pm to 9.00pm. Our office will be closed for Christmas holidays 17 December and we will re-open 21 January. On-line enrolment is available throughout all the holidays but please note that if you pay by Internet banking, your receipt will be emailed to you when we re-open. NCEA SUMMER SCHOOL STARTS 14 January 2019. Our programme has a range of family-friendly courses. These are designed for students 13 years or older accompanied by a parent or caregiver. Please check out the family friendly category on our website. 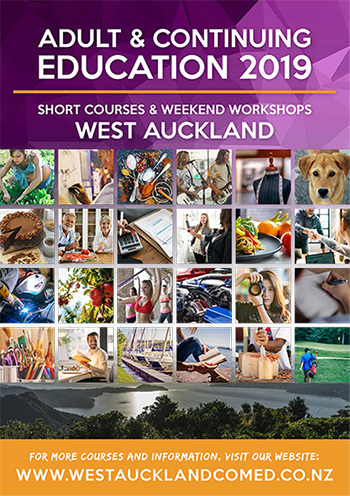 Copies of the 2019 Adult and Continuing Education Booklet were distributed to Waitakere households mid January 2019 if you didn't receive your copy please let us know and we will post you one. We are thankful to the the Henderson-Massey and Waitakere Ranges Local Board for the financial support towards the distribution of our 2019 programme booklet to over 65,000 households in Waitakere City.